Sift together into a bowl the flour, bicarb, ginger and cinnamon. Lightly beat the eggs and golden syrup together and add to the mix and combine until it clumps together. Pre-heat the oven on CONVECTION 180C. Lightly flour a work surface and roll the dough out to ¼” thickness. 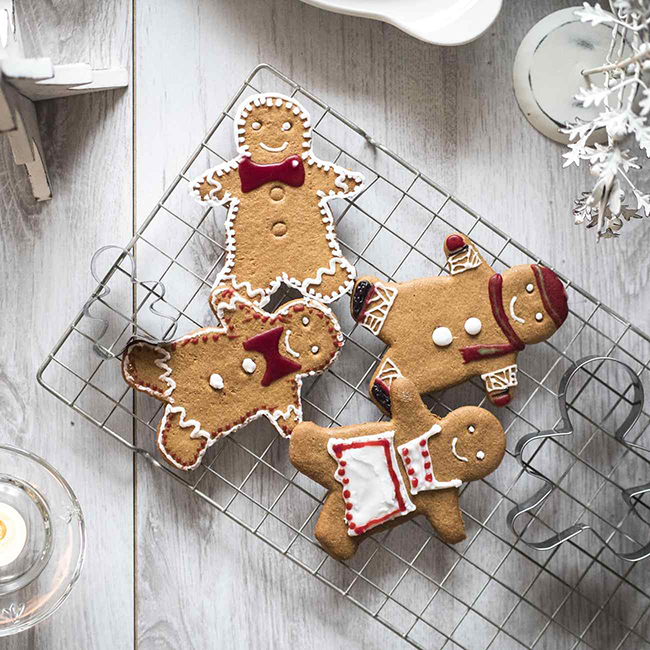 Using cutters cut out your ginger bread shapes and place on the backing trays leaving a gap between them. Bake for 12-15 mins or until lightly golden, leave on the baking tray to cool for 10 mins before moving to a wire rack to finish cooling. When completely cool decorate with the writing icing.